An old barn, a missing board, a peek inside, an interesting discovery. I've no clue what's actually in that jug. It can remain the old farmer's secret. I invite you to view this one on black. What a great story within a story! This such a terrific find. The weather boards have really nice texture. And of course the star sits just left of center, almost hiding behind part of the wall. I love to look at old abandoned buildings, imaging the stories that the walls hold. Moonshine! Shhh...the Revenuers will be by. Provocative! So many textures, that glimpse of the wall beyond, the shadows on the jar - wonderful shot! Wonderful story telling shot, beautiful textures. Really nice job! Thanks for your kind comments on pink petals and pink and green, it's greatly appreciated. Thanks for the invitation to view it on black...such a good illustration of a marvelous mystery tale! No thinking person would as much as dip a finger into the brew, but it's not "what it IS" but the possibility of what it COULD be and the history surrounding it! Interesting find. Nice old barn. Ooooh how intriguing. Love the old bottle and it's rich red liquid. 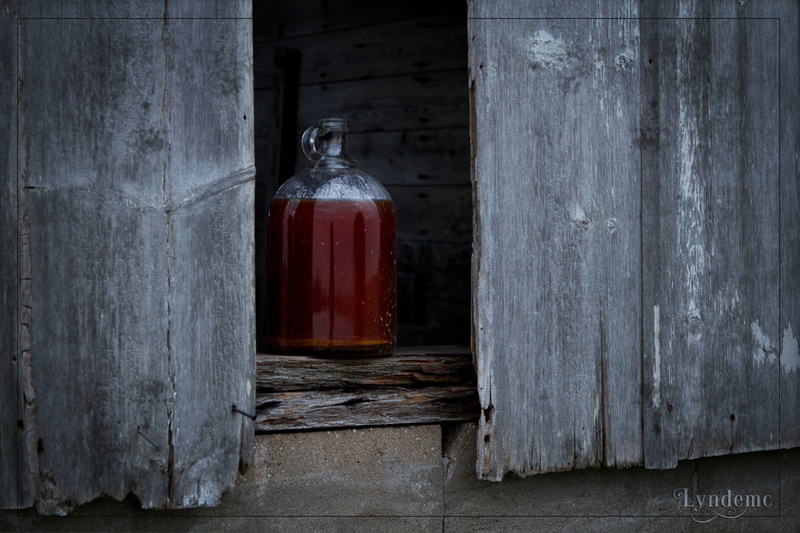 Love the old barn wood and that jug! Wonderful textures! Good eye! Awesome texture, Denise! I feel and smell country old barn. Rustic and creative...hmm moonshne in the jug? It's got to be Moonshine... and well aged in the barrel by the look of that deep rich colour. This is a lovely composition Denise. Great pov, textures and tones, love the reflection in the jug. Great texture and like the pop of red! Thank you for that invitation - it is SO much better on black! What a wonderful find. I just love it. Isolating and simplifying a subject like this really works for me. The subtle lighting, and textures add depth and interest to the shot. Really well done. fav.